Last Updated: April 17, 2019 · Published: May 9, 2017 By: Asian Caucasian 12 Comments This post may contain affiliate links or sponsored content. 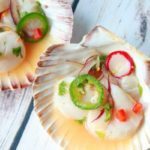 This super easy, crazy delicious Spicy Scallop Ceviche recipe was inspired by a starter dish I had at my favorite wine tasting bar, Stem Wine Bar. These succulent scallops cook themselves in citrus juices. So, I threw in every citrus under the sun — lemons, limes, oranges, and grapefruit. Just four hours later and, voilà, you will not believe how amazing these taste! I also added some heat with jalapeños and shaved radishes, and brightness with colorful cilantro and red bell peppers. Serve them in a scallop shell or martini glass. So impressive! 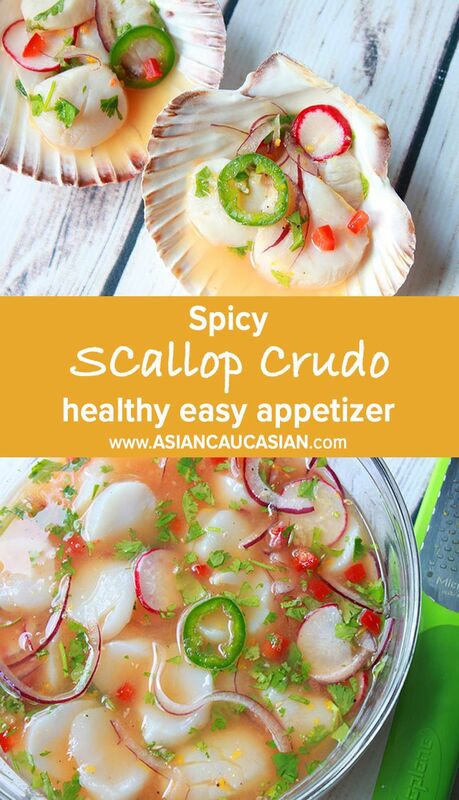 These delectable scallops will cook themselves in the citrus juices, making it such an easy appetizer. Impressive too! 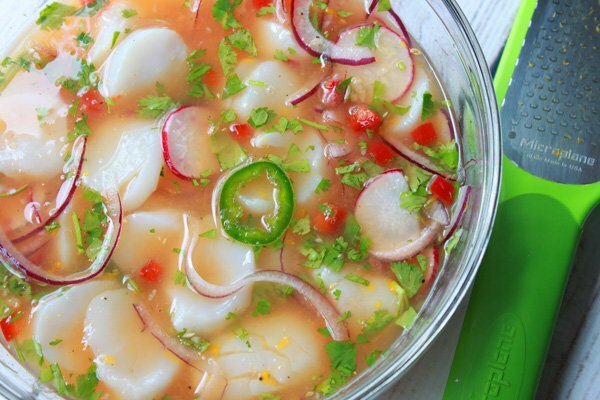 This Spicy Scallop Ceviche recipe is almost too simple to make. Easy and impressive, the scallops cook themselves in citrus juices! Clean and remove the small muscle from the scallops. Slice the scallops in half length-wise. Set scallops aside. In a medium mixing bowl, add the juices from the lemons, orange, orange zest, lime, and grapefruit, stir together well. Stir into the bowl the garlic, jalapeño, radishes, onion, bell pepper and cilantro. Season with salt and pepper. Add in the scallops making sure the scallops are soaking in the juices. Cover and refrigerate for at least four hours (the scallops will cook naturally in the juices). Sprinkle more cilantro on top when ready to serve. 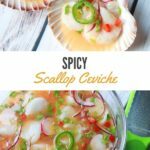 I absolutely love ceviche and that’s why tried this recipe. I loved the fresh flavors. I’m making this again at Christmas dinner. So glad you enjoyed it! This will be perfect for Xmas dinner! It’s so elegant and tasty. OH MY! I just had twin boys and am SO happy I can have ceviche again. Trying this recipe ASAP! Yay! Being pregnant certainly limits the raw seafood element! Not sure I could survive with out it! Ha ha! This dish looks so pretty. I think it would make a delicious light starter at Christmas or any time! Absolutely! It’s so impressive and they will never know how easy it was go make! Love your food styling! Great photos! Thanks, Amanda! These shells were not expensive but look so impressive when serving! I can’t wait to try this recipe, it really looks delicious and fancy! Your presentation also look beautiful! Thank you! We eat with our eyes, right? So I presented the scallops in these inexpensive scallop shells! Looks fancy, but it’s not! I can’t wait to make this beautiful dish for my dinner guests! Thank you, Laurie! This is such an impressive dish but super easy to make. Your dinner guests will never know how easy it is!